Hotel Petit Palace Londres - London, Madrid. Petit Palace Londres - London Hotel Madrid. Petit Palace Londres - London. Fantastic rooms in the heart of Madrid, close to all symbolic places and main attractions, like Puerta del Sol, Plaza Mayor, El Prado Museum, Royal Palace, etc… and a few steps far from its famous shops in Preciados street. The best place to know and enjoy the Spanish Capitol City. SPECIAL GIFT: Free bottle of wine D.O. Ca. 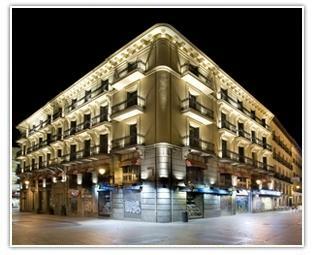 Madrid (one bottle per room). High Tech Hotels collaborates with the N.P.O Solidarity International by supporting the organization of artisan objects; SELYN of Sri Lanka through buying their hand made dolls by which they contribute to improving the living conditions of the families of Kunergala, Sri Lanka. High Tech acquires a commitment with the disadvantaged countries, resting Trades Rightly for a development that promotes the equality between the countries. Collaborates you also reserving a familiar room, we will give you one of these solidary dolls.